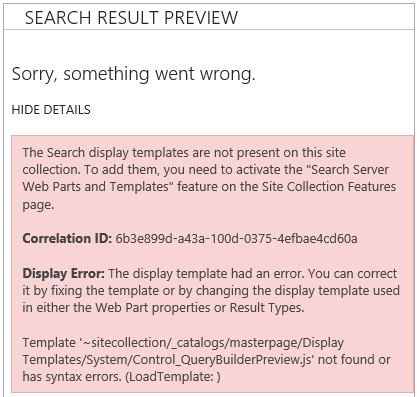 Not able to view result while building Search Query – Share SharePoint Points ! Here is another quick finding which I just thought should be shared to save someone precious time. If you are dealing with SharePoint 2013 search and Result sources, you must try to test the query template before saving it. If you are not able to see any results instead just a red error saying below text don’t get scared I have quick solution for you. You must get frustrated because your search is properly configured, its crawling the data and you are able to see results while searching. After looking at what was missing I found that in fact there was a feature missing on the Central Administration site collection. The feature is called Search WebParts. Bingo!! Just, re-open the “build your query” page, and everything should work properly! Hope that post was able to help you. Please press like button it that saved your time.